Shahi Tukra must be one of those dishes that I have been forever reading about and wanting to make. I guess almost ever since I started baking some 15 years ago. That’s when I first started using Milkmaid and along with it, I got its recipe book that had such pretty food pictures. I used to literally drool over them and I have cooked most of the recipes, except for few like this delicious Shahi Tukra. On reading it, I realized it sounds very much like the Bread Halwa that we make, of course with a major change that alters the entire taste. Looks like I had to wait for an eternity to finally make this dish. As with all BM’s I have been so without any ideas on both the themes I did this edition. However, when compared with the first week, I knew I will be able to make the second week where I am supposed to dress up a leftover with a new avatar! Imagine making something to become leftover and then creating this dish. I confess on few occasion, it was more of an idea than the actual dish being a leftover. But then I guess it’s all fair in blog and war if I may borrow and change the cliche! Coming back to the Shahi Tukra, do I have to say that Konda loved it? I almost thought that she was just giving me those expressions just to please. You never know right, just so that I confirmed with Hubby dear on the taste and he said the dish did match her ecstatic expression. I was happy hearing that naturally. And know that this is something that will be featured more often. In spite of this being a rich and creamy dessert, I wanted to make sure I reduced and modified something in this. The bread is supposed to be deep fried. I wanted to avoid and shallow fried it. I seriously don’t know how much of a taste that must change but presume it to be a small bit when you consider a number of calories it must otherwise give you. And to make sure I fit the theme, I used leftover bread. I pinged Harini to confess if she was okay with me using a leftover bread. 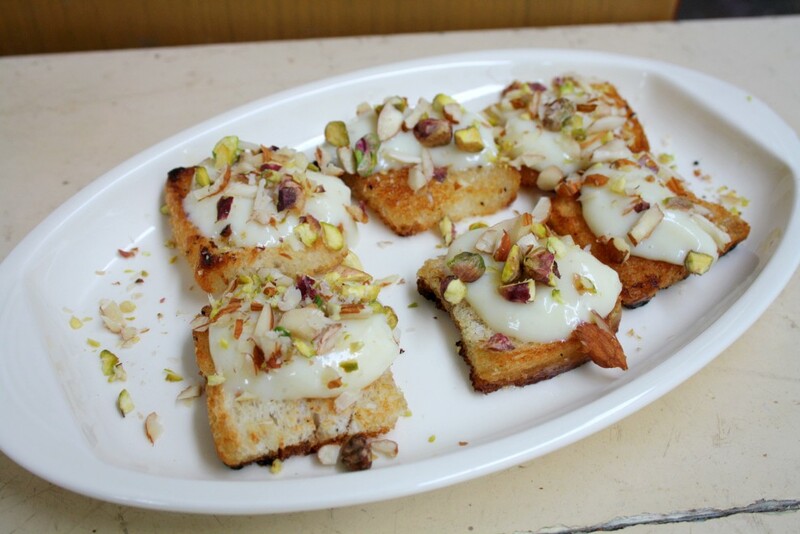 She was and that’s the reason why you get to read about this Shahi tukda and drool over it. Almonds and Pistachios finely chopped for garnish. In a bowl, take the corn flour and add 2 tsp of milk and blend well to form lump less liquid. Keep it aside. In a pan take the condensed milk and add the rest of the milk. Bring to boil. When it starts to boil, simmer and slowly add the corn flour mix. It will thicken very fast so keep stirring constantly. This takes only about 2 mins or so, you will have a thick mix in the pan. If required thinner the cream by adding more milk or condensed milk. Else keep it aside. Notes: One way to get that creamy texture is to pulse this condensed paste in a mixer for a smooth paste. Trim the sides and cut into two or four squares depending on how you want to serve. If you are going to shallow fry, then heat a pan add 1 tsp of ghee and oil. Once it’s hot, place all the bread pieces and fry over a low flame. After a couple of minutes, sprinkle the rest of the ghee and oil. Flip to the other side. If you are going to deep fry, take a Kadai with little oil and heat. When it’s hot, deep fry the bread pieces in batches. You will have to add more oil/ghee as you finish up the whole lot as the bread will dunk more oil/ghee. Deep frying will make the bread be very crisp, while the shallow frying will take a longer time to become hard. In a pan, take the sugar and water, bring to boil. Remove impurities if any. Continue boiling till you get a sticky syrup which will be 1 thread consistency. Switch off the flame and remove. Dip the fried bread into the sugar syrup and remove to a plate. When you are done with all the bread pieces, arrange on a plate. 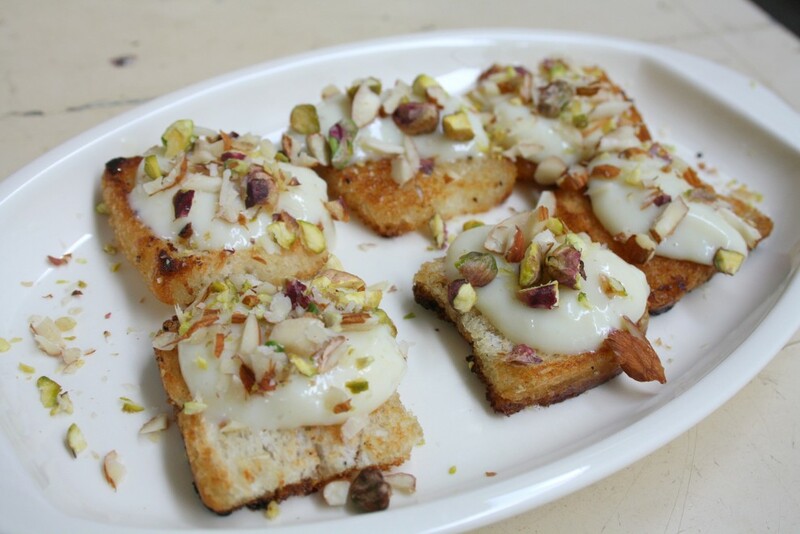 Scoop a spoonful of condensed milk cream on each bread piece and garnish with finely chopped almond and pistas. These will make a great dessert for a party both for adults and kids as well! If you want to make this a rich affair then you really won’t be able to indulge in this frequently. I think this low fat, low calorie will suit all our requirement! And the theme “Dressing up Leftovers for Kids” for the second week. Hope you enjoyed reading these as I had enjoyed making them. This is an interesting version of shahi tukra also very convenient. You are really lucky that your kid likes sweets. Mine run away. Like i have said they distract me. 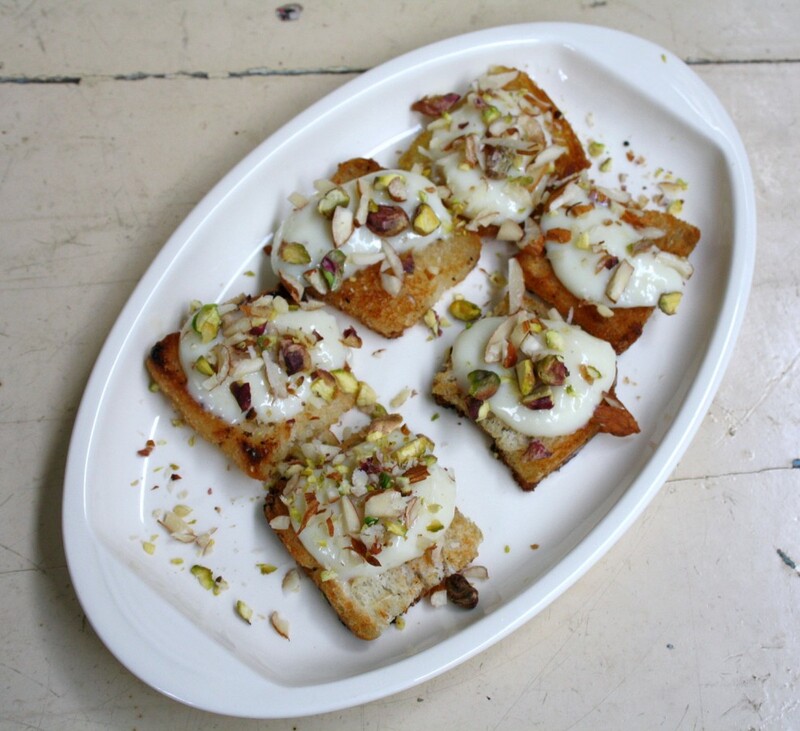 Love the shahi tukre I will spend my days drooling over them & dreaming that some day I will make them. I have enjoyed my time doing this BM. Thanks a lot. 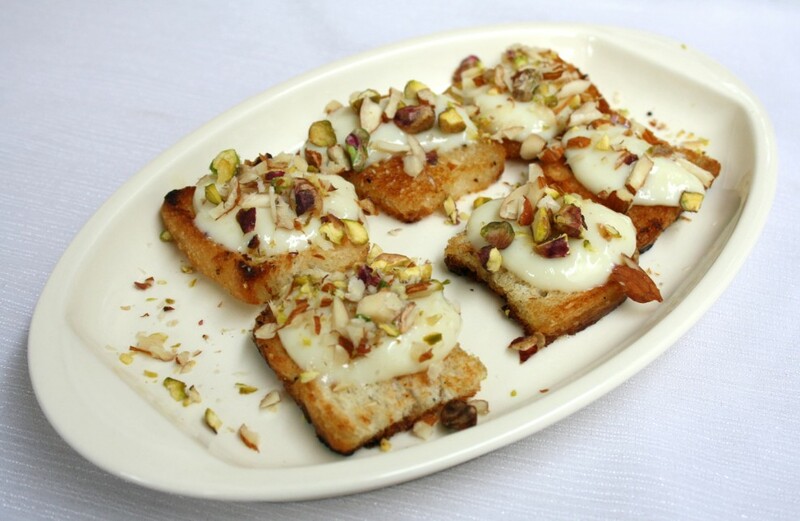 Yumm Shahi Tukre!,My fav Dessert.The recipe is Super Good.Luv it. Irresistible shahi tukra, truly inviting.. Perfect temptation Valli.Hope kids had a good time. Valli to cut down more calories ..you can toast the bread….well…well ofcourse there is a difference in taste if u deep fry ..but I am sure we grown ups can compromise….the shahi tukdas look yum!! New and interesting one Valli. Glad to have done the marathon this time. It was fun.